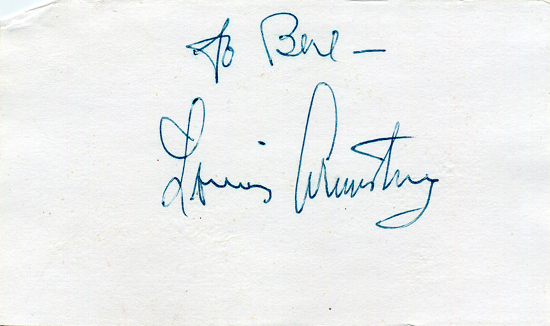 More eBay autographs . . . some surprises! Of course, Louis signed his name how many thousand times from the middle Twenties to 1971 . . . but each one is its own treasure. Lucky Bill! The seller describes this as signed in green ink (a mark of authenticity) even though it reproduces as blue. Here’s something much more unusual. At first, it looks only like an antique check (1936) but then you see it’s made out to trombone legend Miff Mole, and the person handing over the thirty-two dollars is Rudy Vallee. 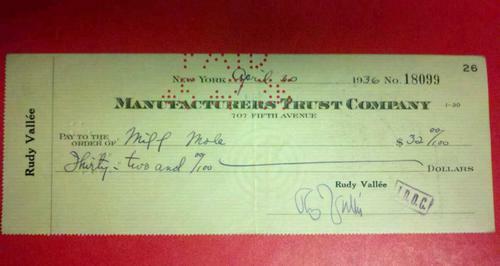 Not to be mean-spirited, but Rudy had a reputation for being reluctant to let money out of his possession, so this is doubly or triply rare — and thirty-two 1936 dollars are a substantial sum. 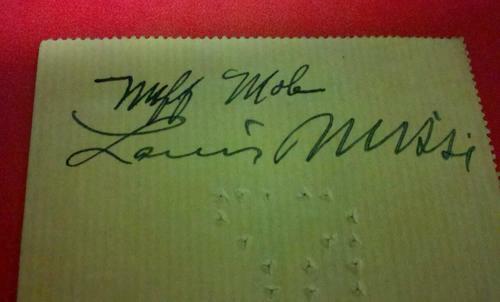 And the reverse, where Miff endorsed the check over to one Louis Mussi. The story? 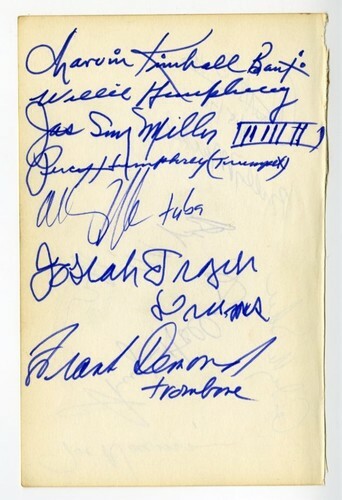 : Here are the signatures of one version of the Preservation Hall Jazz Band: Narvin Kimball (banjo); Willie Humphrey (clarinet); “Sing” Miller (piano, in a rebus); Percy Humphrey (trumpet); Allan Jaffe (tuba); Josiah “Cie” Frazier (drums); Frank Demond (trombone): That in itself would be pretty good — as satisfying as a half-pint of Mrs. Circe’s gin . 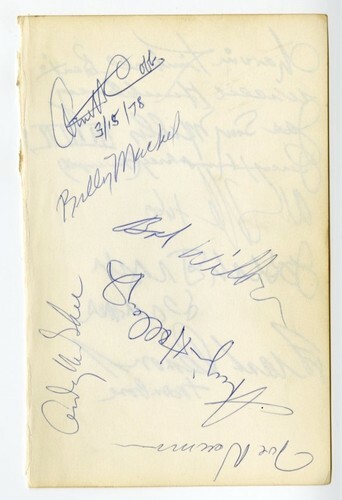 . . but the “unidentified” signatures on the back of this page are also intriguing: Some of those might remain mysterious — I have trouble turning my head to the required angle . . . but top left (March 15, 1978) is Arnett Cobb and long-time Lionel Hampton guitarist Billy Mackel; to the left is Andy McKee, and in the middle I am certain that Robert Sage Wilber — otherwise known as Bob — signed in. My intuition tells me that this page comes from a Nice Jazz Festival . . .
Of late I have been living in a temporary self-created chaos, attempting to pare down a surfeit of possessions from my apartment. Today I opened a closet and decided to move a stack of four wooden crates containing about a thousand cassette tapes collected and traded over the past twenty-five years. Drawn irresistibly to their labeled spines, I thought, “My God, there’s so much music here that I haven’t heard in years — and would delight in — that I really should dig out a half-dozen and enjoy them.” The cassettes, as well, brought back memories of years of tape-trading with generous collectors, including Bill Coverdale, John L. Fell, Bob Hilbert, Manfred Selchow, Tom Hustad, David Goldin, and a dozen more. 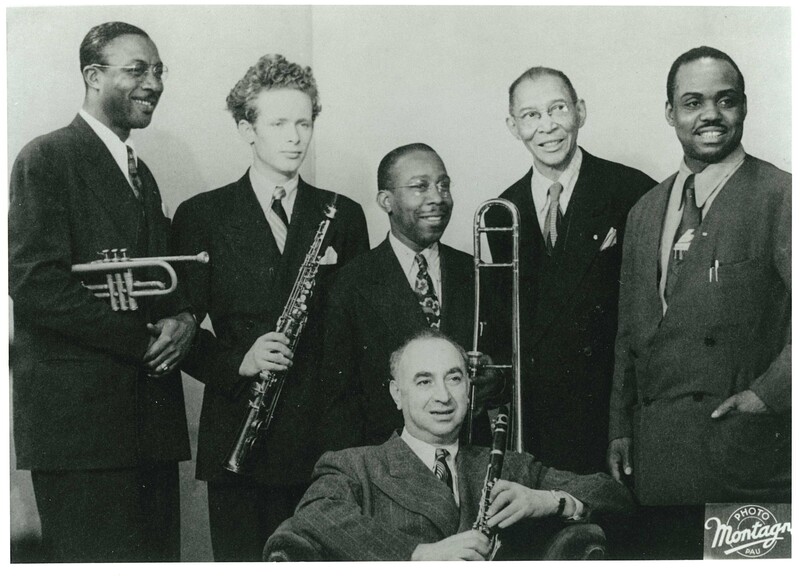 So this morning, I was driving into Manhattan, exulting in an hour of rare Don Byas (with John Mehegan, Vic Dickenson, Slam Stewart, and perhaps Lem Davis on alto) — including rehearsal versions of INDIANA and I GOT RHYTHM, preliminary to the famous Byas – Slam duets at Town Hall in 1945. These acetates, by the way, were recorded by Baron Timme Rosenkrantz in his apartment. The music pleased me more than I had expected, so I have resolved: the cassettes are coming out into the open, where I can play them (the space in the closet will be filled, easily) and rather than be tempted to buy the first new jazz compact disc that winks at me, I will rediscover some of these treasures. Not, mind you, as an exercise in asceticism or frugality, but as another way to pleasure. At this stage of my life, I am not prepared to swear off new compact discs. I am also not organized sufficiently to have an official rediscovery every day, but since my car still has a cassette deck, these old-time artifacts can enlighten and elevate me during my commute. What awaits me? Lee Wiley. Louis with Gordon Jenkins on television from 1952, on-location recordings from the Nice Festivals of 1974-5, and more. I urge my readers to revisit those treasures they haven’t played in years — whether the stash is under the bed, in the basement, or simply on high shelves. And if the collection is fertile, you could almost close your eyes and pick “the fifth cassette from the left” and come up with a pleasant surprise. If you come up with something you dislike, perhaps it means that the particular cassette isn’t worth saving. Either way, you win. I’d vbe fascinated to hear from readers about what delights they find . . . . Some of my readers will rejoice at the names of venerable jazz players Rollins, Corea, and Burton; others will be pleased to see younger players. It must mark me as someone of a nearly-extinct generation when I write that I miss the old days. European friends, over the years, sent me on-location tapes from Nice festivals in the Seventies, featuring Bobby Hackett, Ruby Braff, Sweets Edison, Bill Coleman, Vic Dickenson, Benny Carter, Teddy Wilson, Joe Venuti, Jo Jones, Sir Charles Thompson, Mark Shane . . . proving that swinging jazz was what prevailed. Now they’ve been replaced by James Taylor? Of course, many of the players at Nice in the Seventies are now dead. But there are five or six dozen younger musicians — from Kellso to Caparone, Block to Blake, Dorn to Nick Ward . . . who would show anyone that jazz existed before Madeline Peyroux.